Chandelier installation is not for the faint of heart and takes a level of expertise beyond that of a typical electrician. Before installing any chandelier, we check to ensure that the electrical box can handle the weight and if not, we replace it with an appropriately strong box to ensure a safe installation. If there is no box available, we can wire for a new one as well. What sets Light-Tech Inc apart from the rest is the amount of care we give to your chandelier. We realize that often times chandeliers are family heirlooms, antiques, or extremely fragile. Besides your personal safety, preventing any damage to the chandelier and your property is our main concern. 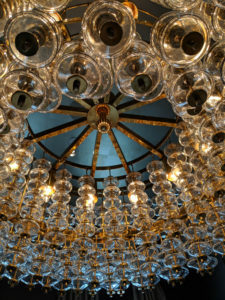 At Light-Tech Inc, we have installed countless new and antique chandeliers. Whether it’s a Wrought Iron or a Murano Crystal Chandelier, we have the expertise and tools to install them safely. Even if other electricians have turned you down due to the complexity of your chandelier, give us a call and challenge us! Before you move, call Light-Tech Inc. and arrange for us to disconnect, package, crate, move, and re-install your precious family chandelier to your new home. We have transported and installed countless number chandeliers in the Houston area and work with you to protect your family heirloom or your new purchases. It is no wonder that Houston’s top moving companies refer and recommend us to their customers. If chandelier cleaning and maintenance is a chore, installing a chandelier lift is the perfect solution. Our chandelier lift installers will install a lift that will safely lower and raise a chandelier so it can be cleaned, re-lamped, or otherwise maintained. Call us today if you need a chandelier lift installation.